Having the right single bed frame and mattress combo is an essential part of making your kids bedroom the perfect place to rest, study, play and sleep in absolute comfort. 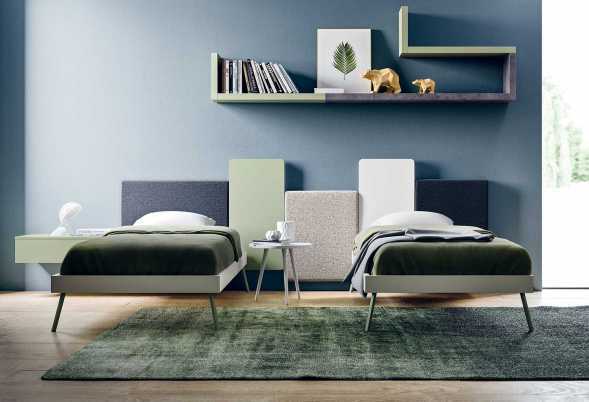 A low single bed is a great solution for youngsters and teenagers thanks to sleek styles and contemporary designs that your boys and girls won't outgrow. If the room is small go for roomier options such as a platform bed with storage or a bed with trundle. The first type offers a handy extra space where you can store bedding, duvets, sheets and linen, as well as additional pillows for guests or seasonal clothing (vacuum bags are a great way to save even more space). As for the second type, a single bed with pull out bed is the answer to sleepovers or to accommodate visitors on a regular basis when you don't have a guest room. 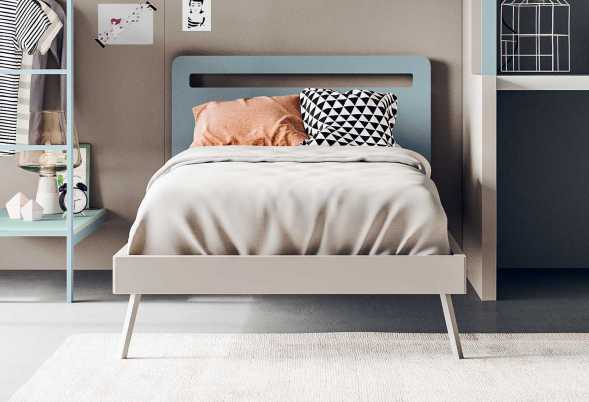 There is a bed for every style and taste: in cool fabric, lacquered or concrete-like surfaces, modern wooden frames, regular single, twin and larger sizes. The huge range of colours will make the choice easier and even more fun for kids and teens who will love to customize their bed and make it a perfect retreat. Our innovative bunk beds totally transform the idea of this type of compact bed which is no longer seen as an "emergency solution" for small spaces or guest houses, but as the perfect choice for siblings sharing a room. Contemporary bunk beds come with storage, desk and may even include a trundle bed for a third sleeper. Depending on the age of your children, you can choose a ladder or an actual staircase with a walkway for extra safety and storage, since each step can hide a super functional storage box. 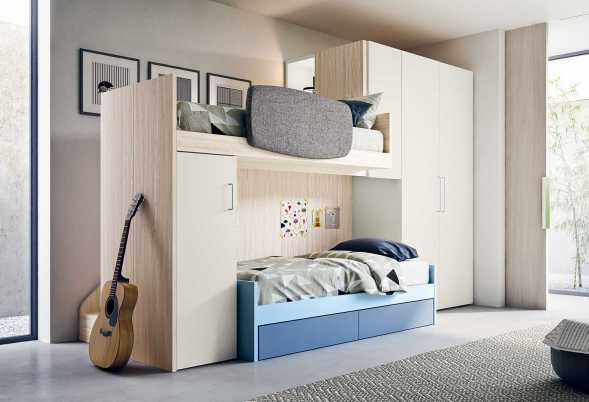 For larger bedrooms you can opt for L-shaped bunk beds with built in wardrobes and shelving, or cool loft beds. These are every teenager's dream as they allow to create a nice nook underneath where they can arrange a lounge area or study corner with computer, tv and game consoles. Most of our bunk beds can be separated into two. Cabin beds and beds with drawers give you and your kids lots of additional storage units. 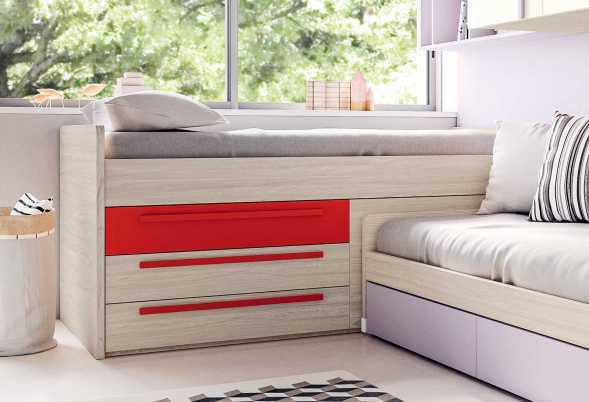 Available in many sizes, they offer pull out drawers, trundle beds and integrated desks, all space savers designed to enhance and make the most of kids and teens' bedrooms. 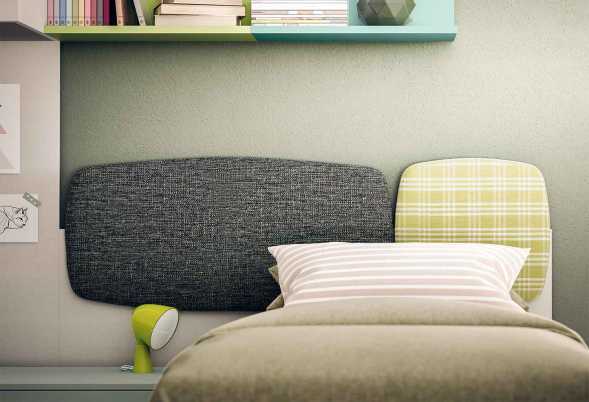 Teenagers will love to have a daybed with storage or pull out trundle they can use as lounge area during the day and easily convert into a comfy bed at night. Don't stop at pictures: bed sizes and colours are customizable. Browse through product pages to find ideas and suggestions, then contact us to find out everything you need to know about our Italian kids' beds, prices and configurations. A great space saver, the XL low sleeper cabin bed for kids is a modular platform bed with storage. Available as single or l-shaped beds for corners. Doll upholstered bed with storage box for bedroom sets. Bed-ring and headboard in fabric or eco-leather. 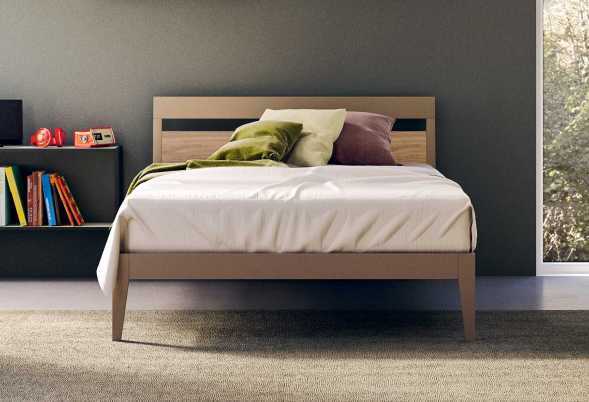 Fresh is a modern wooden single bed. Available also in a large single model. Perfect for kids or teen bedroom sets. Sky is a unique high quality kids bunk bed with desk and ladder, a functional and playful space with shelves, study area and under bed storage. 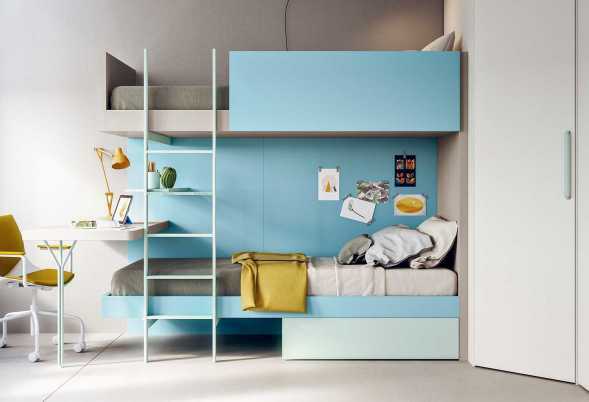 A space saving bunk bed for children and teens. Custom modular upholstered wall panels for bespoke headboards or any other room in your house. Available in fabric, melamine or premium lacquer finishes, with integrated led lighting. Tonga is a contemporary single bed frame with a sleek curved headboard in elm wood effect and many types of legs to choose from, ranging from clear acrylic to metal. Castello is a narrow bunk bed. It comes with two beds, or in a loft bed model with built-in desk, shelves or wardrobe. Lobby Corner bed with storage and drawers. Designed to manage narrow bedroom sets in the best way possible. Cale single bed frame with upholstered headboard is a stylish solution for kids’ and teens’ bedrooms. Wide range of frames available, from sleek metal legs to drawers, trundle and storage. Castelponte corner bunk bed with storage is available as cabin bed with wardrobe underneath or as loft bed with bridging units, the top bed is complete with lateral or back stairs. 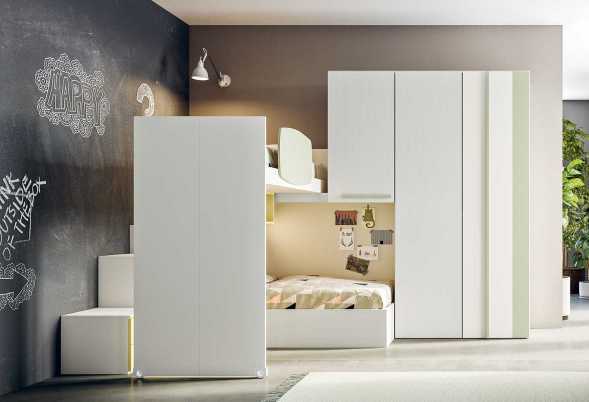 Castelponte is a high sleeper bed with wardrobe available with 1, 2 or 3 doors and bridging unit. You can customize the elevated space below the upper bed with a low cabin bed, desk or couch. Castelponte Wheels is a corner bunk bed with storage stairs or drawer-stairs, which can be hidden by sliding the high sleeper above the staircase. The frame incorporates 1 or 2 bridging cabinets. 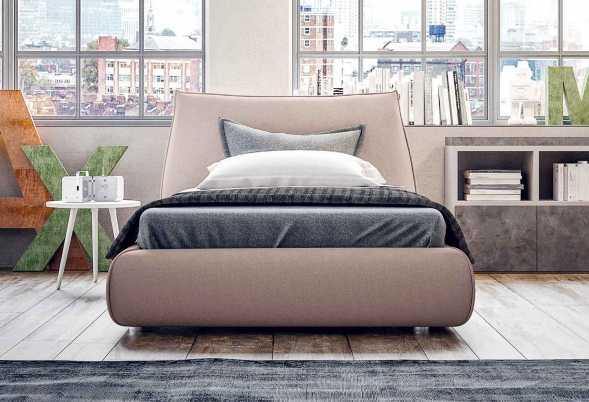 Slitta design single bed, upholstered and covered in fabric or eco-leather with coloured profile. Also available as large single and double bed. Tex single bed for kids with coloured headboard. Also available as a large single bed, suitable for teens. Cloud modular upholstered headboard wall panels are multi-purpose decorative panels available in a huge range of fabrics you can choose from, with removable or fixed cover.